Alaska Picture Post Cards, 44 mostly unused cards; includes many real photo cards including ship wrecks, street scene including Flat City, "Alaska Mail Team" dog sled, Eskimos, etc., some cancel interest, generally F.-V.F. or better. 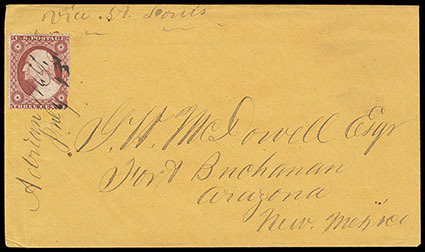 (Arizona) 1860 (c., July 13) Adrian N.Y. to Fort Buchanan, Arizona, New Mexico Territory, orange buff cover endorsed "Via St. Louis" bearing 3¢ dull red (26), perf flaws, tied by manuscript "Adrian N.Y., July 13th" postmark, Very Fine and scarce use carried along the Butterfield Overland Mail route from St. Louis to Arizona. "7,000 feet above the clouds on the summit of Pike's Peak in the U.S. Signal Office, Nov. 17th /74", dateline on letter only starting "…I arrived here the highest point of civilization at 1. O'clock P.M. I sincerely hope you feel better than I do, I have one of those dizzy head-aches…I have not the descriptive powers to give you the slightest idea of the grand views I've seen this after noon, about 100 yards north of the house is a great crater over 5000 (five thousand) feet deep…we rolled some great boulders down & it took over five minutes for them to reach the bottom…", Very Fine and interesting letter. 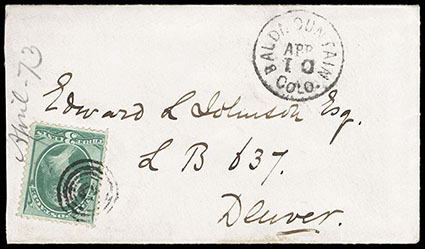 Bald Mountain, Colo., Apr 10, cds with matching target handstamp tying 3¢ green (147) on small cover to Denver Col., manuscript "April 73" docketing at left, Very Fine, The only known territorial postmark from Bald Mountain which was the preceding post office name for Nevada, ex-Bauer. The Post Office Department had its own ideas about post office names. 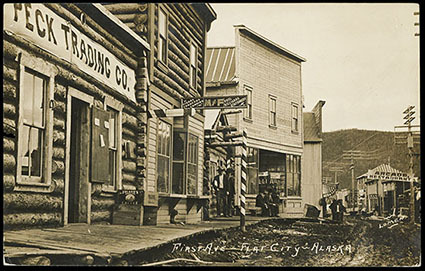 In this case, confusion with Nevada City, California, was the stated reason for a name change. However the residents after refused to accept the change as applying to the town. 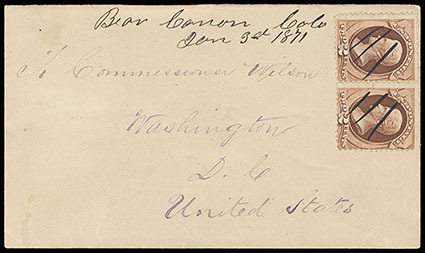 "Bear Canon, Colo., Jan 3d, 1871", manuscript postmark and matching ms. strokes cancel 2¢ red brown (146) pair on cover to Washington D.C., Very Fine and choice, ex-Bauer. THE ONLY RECORDED POSTMARK FROM BEAR CANON, COLORADO TERRITORY. Bear Canon located in Douglas country south of Denver. Post Office opened on April 7th 1869 and closed on August 4th 1879. Marcus L. James was postmaster. 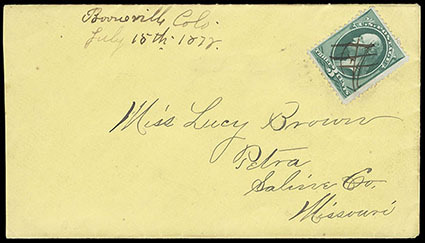 "Booneville, Colo., July 15th, 1872", manuscript postmark and matching cross-hatch cancels 3¢ green (158) on yellow cover to Perta, Missouri, Very Fine, ex-Bauer. This cover is listed by Jarrett as the EKU and only recorded territorial use. Unfortunately, upon the year date is not "1872", but rather 1878 in line with another example from this correspondence (See Rumsey Sale 73 Lot 1060) and the correct stamp issue. 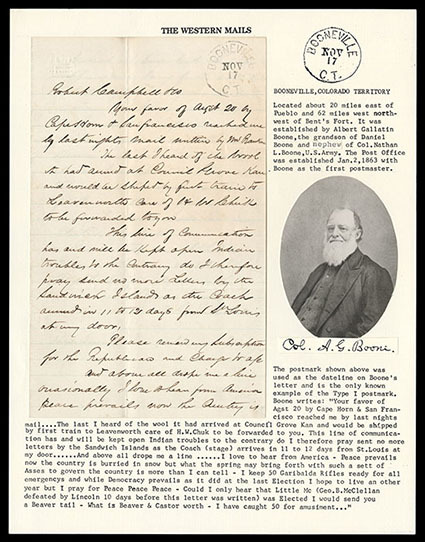 Booneville C.T., Nov 17, clear strike of cds used as dateline on 1864 letter from Col. A.G. Boone with interesting content "Your favor of Agst 20 by Cape Horn & San Francisco reached me by last nights mail…The last I heard of the wool it had arrived at Council Grove Kan and would be shipped by first train to Leavenworth care of H.W. 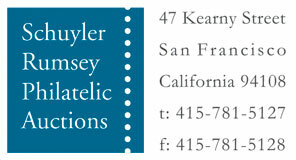 Chuk to be forwarded to you. This line of communication has and will be kept open Indian troubles to the contrary do I therefore pray sent no more letters by the Sandwich Islands as the Coach (stage) arrived in 11 o 12 days from St. Louis at my door…I love to hear from America - Peace prevails now the country is burried in snow but what the spring may bring forth with such a sett of Asses to govern the country is more than I can tell - I keep 50 Garibalda Rifles ready for all emergencys and while Democracy prevails as it did at the last Election I hope to live an othe year but pray for Peace Peace Peace - Could I only hear that Little Mc (Geo. B. McClellan defeated by Lincoln 10 days before this letter was written) was Elected I would send you a Beaver tail - What is Beaver & Castor worth - I have caught 50 for amusiment…" and signed "A.G. Boone", Very Fine and scarce territorial letter, One of only two recorded examples of this Type 1 Territorial Postmark, ex-Risvold on his page. Booneville, Colorado Territory was located about 20 miles east of Pueblo and 62 miles west northwest of Bent's Fort. It was established by Albert Gallatin Boone, the grandson of Daniel Boone and nephew of Col. Nathan L. Boone, U.S. Army. The post office was established Jan. 2nd 1863 with Boone as the first postmaster. 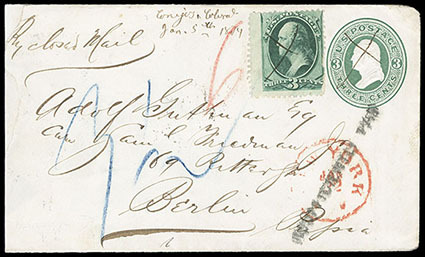 "Conejos, Colorado, Jan. 5th, 1874", manuscript postmark and matching manuscript "X" cancel on 3¢ green (158), edge flaw, on 3¢ green entire to Berlin, Prussia, manuscript "By closed mail" endorsement at top, red "New York, Jan 22" exchange cds and straightline "Insufficiently Paid" handstamp; cover a bit reduced with repaired edge nicks at left, Very Fine appearance, ex-Bauer, Pacetti. THE ONLY RECORDED TERRITORIAL MANUSCRIPT POSTMARK FROM THIS POST OFFICE. The 6¢ per half-ounce rate was for the direct rate via N.G.U. to Berlin, Prussia. 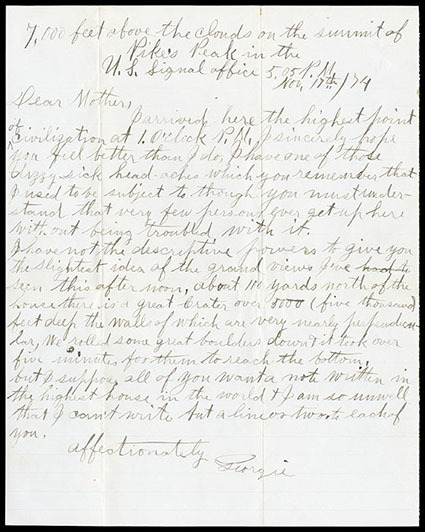 This letter was marked "By Closed Mail" (7¢ per half-ounce), hence the "Insufficiently Paid" marking. 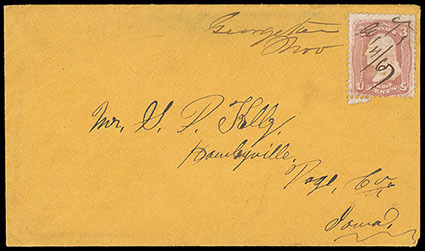 "Fair Play Col., Aug 13, 1866", manuscript postmark and ms. matching cancels on 2¢ black (73) and two 3¢ rose (65) singles, on a very puzzling yellow 1866 cover to France, two of the stamps were correctly overstruck with the oblong "Short Paid" handstamp (the correct rate to France was 15¢, with prepayment optional), inexplicably, the Chicago office also applied the circular red "Chicago Ill., Paid 12" credit exchange cds as fully prepaid, red Calais entry cds and matching "PD" framed handstamp, Paris (9.13) transit backstamp; some docketing on face, Very Fine, Illustrated in Jarrett's Colorado book., ex-Persson, Bauer, Pacetti. A WONDERFUL 2¢ BLACK JACK COLORADO TERRITORY USE TO AN OVERSEAS DESTINATION. 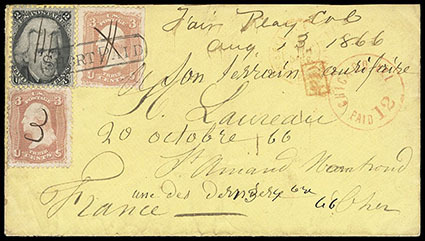 A very puzzling cover to France with 8¢ in postage underpaying the 15¢ French mail treaty rate exchanged in Chicago, where two of the stamps were correctly overstruck with the oblong "Short Paid" handstamp. The "Paid 12" handstamp was incorrectly applied by the Chicago office possibly before the short payment was noticed, a surprisingly rare example of an uncorrected error by an exchange office. "Georgetown C.T., Nov 4/67", manuscript territorial postmark also cancelling 3¢ rose (65) on orange cover to Hawleyville, Iowa, with original enclosure, Very Fine, ex-Meroni.